Notes: Olathe South plays one Thursday night game on 10/23 ... the team hosts both of the games against Blue Valley schools in district play. Potential Trouble: Olathe South's schedule is for the most part, manageable. The true tests will come at the end of the season in district play. Fortunately for the Falcons, they won't have to travel to any unfamiliar Blue Valley stadiums this season. This should provide an advantage against Blue Valley Northwest and Blue Valley West, but both games will still be tough. Wrapping up the district will be a game against rival Olathe East. Olathe South will truly have to earn a playoff berth in one of the toughest Kansas 6A districts. Biggest Game: Olathe South plays rival Olathe North in week two of the season in what should be a heated battle. Olathe North sent Olathe South's seniors out with a 48-7 obliteration last year, and you can imagine the game is still fresh on the minds of the Falcon's players. A revenge game? Perhaps, but it will also be Olathe South's chance at putting themselves back on the map after two losing seasons in a row. Notes: The Lancers play Thursday night games on 9/16 and 10/7. Potential Trouble: After three weeks of home games to start the season the Lancers have three away games, none of which will be at Shawnee Mission District Stadiums. The three game stretch isn't completely brutal (Olathe North, Lawrence Free State and Olathe Northwest), but it will be a pivotal part of the season for the Lancers. The last thing they want to do is perform poorly in the games leading up to the all-important district play. Biggest Game: Weeks one and eight are the big ones for the Lancers. Last season SM East beat SM Northwest 13-12 in district play. The win virtually sealed the Lancer's playoff berth, and kept SM Northwest out. The two team's week one matchup will be a grudge match to find out if last season's outcome was a fluke. 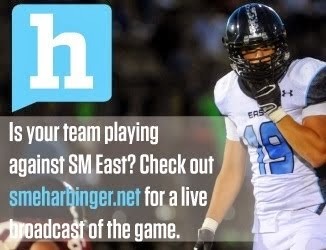 In week eight SM East takes on rival SM West. Most Lancer fans can't remember the last time they beat SM West. The game should be a hard fought battle, as always, and there will be playoff implications. Notes: The Pioneers play one Thursday night game on 9/23 ... all of the Pioneers home games will be played in their new stadium, shown below. Potential Trouble: Leavenworth is riding a 15-game losing streak into the season, and until that streak ends the team will have trouble buying into new head coach Kevin Kopecky's system. The Pioneers play three home games in their first six games leading up to district play. It would be huge if the team could garner a win during that stretch. Taking a 21-game losing streak into district play in year one under Kopecky would be quite dejecting for the program. Biggest Game: Leavenworth will be in position to claim a playoff spot in their game against SM North in week nine, assuming they are able to take care of Wyandotte in week seven. Chances are the Pioneer's showdown with SM North to end the season will be a battle for the last remaining playoff berth in the district.